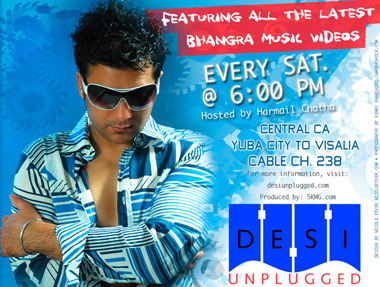 Calling All Desi Unplugged fans! The TV Show is looking for a few good men and women to join the Exclusive Desi Unplugged Street Team! Do you think you have what it takes to be a Street Team member? What exactly is a Street Team? Well, simply read below and if you're interested in helping out the TV Show, we'd like to hear from you! Street Teams are comprised of groups of fans that join forces to help promote their favorite TV Show in their hometown or surrounding area. Members use promotional materials like Flyers and Posters to give away to people and hang up around town. Additionally, the team spreads the word throughout the online world via related bulletin board postings, encouraging the adding of official web banners to related websites and e-mails. What do I have to do as a Street Team member? All we ask is that you reach out to Bhangra fans like yourself by promoting Desi Unplugged. We will be sending exclusive emails to all the Street Team members, with downloadable flyers and/or posters. All you need to do, is make a printout of the flyers, make some Xeroxes and spread the word. We will mail you posters and stickers to hang at stores and Gurdwaras. We're hoping to get multiple members from each city or town. All Street Team Members are asked to also promote Desi Unplugged online. You can do this by posting about the show on myspace, facebook, friendster, in chat rooms, spreading the word in related message boards, etc. So do you think you've got what it takes? We'd love to hear from you! Street Team positions are assigned on a first come/first serve basis. There are a limited number of spots for each area. If you are selected to represent your area, you will be notified via e-mail. To request a spot on the street team in your area, please send an email from the Contact page.